Valeant Pharmaceuticals had a rough time in the market yesterday and is continuing declines today. 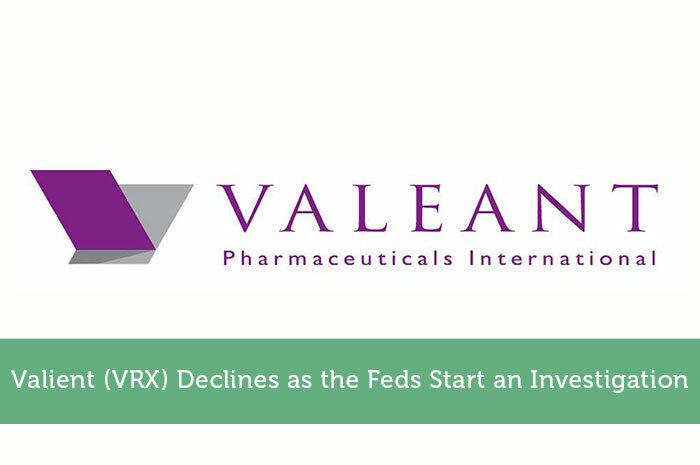 Unfortunately for VRX and its investors, Federal investigators have opened a case looking into how the company prices its treatments; causing massive declines in the stock. Today, we’ll talk about the investigation, how the market has reacted thus far and what we can expect to see from the stock moving forward. As mentioned above, Valeant Pharmaceuticals is having a rough time thanks to a Federal investigation into their methods of pricing. This comes amid a string of pricing debates with regard to the biotechnology industry as a whole. Even Hillary Clinton has weighed in on what she calls “Price Gouging” in the medical space. On Wednesday VRX announced that it recently received subpoenas from the United States Attorney’s Offices in the Southern District of New York as well as Massachusetts. Through the subpoenas, a request by Federal investigators came for details with regard to the distribution of the company’s products, pricing information given to the Centers for Medicare and Medicaid Services and the financial support the company is and has provided to patients. It is believed that the investigation revolves around two of Valeant’s most successful treatments, known as Isuprel and Nitropress. As evidence that the company is making the drug affordable for those in need, a VRX spokesman announced the amounts of money that the company has spent offering patient assistance programs. In the year 2014, that total came to $554,000,000 and in 2015, it’s expected that the company will pay $630,000,000 in an effort to help patients with financial assistance needs. As investors, we’ve come to expect that anytime bad news comes out with regard to a publicly traded company, we tend to see declines in the value of that company. This proved to be the case with regard to VRX. After Wednesday’s dramatic declines, we continued to see more declines Thursday. By 12:24, the stock was trading at $166.40 per share after a loss of 6.14%. In my opinion, we can expect to see two completely different things, depending of course on how far forward you plan on looking. In the short term, I’m expecting to see more declines. There are few things that scare investors more than Federal investigations, and this one is definitely striking fear in the hearts of VRX investors. However, looking at the data, while I understand the reason for the investigation, I have to say that I’m on Valeant’s side. It doesn’t seem as though the company has done anything illegal and I believe that this will be public knowledge by the end of this debacle. With that said, Waiting for the declines to rest and buying when VRX meets support is likely to prove to be an incredibly advantageous move. Where do you think VRX is headed and why? Let us know in the comments below!